Google is taking another swing at the messaging space with a new app called Allo. It's yet another way for users to talk with their friends, but with a couple of neat twists including a "smart replies" feature that even works with photos. Using Allo, people can quickly reply to a conversation using artificial intelligence-driven Smart Replies that Google lifted from its Inbox email product. That means instead of typing a reply, you can tap on bubbles that show up to suggest responses. Smart Replies also works with images, thanks to Google's image recognition technology. So if someone sends a picture of their dog, the recipient can quickly answer with "Cute dog!" without typing that out. Google is going after a crowded market, competing against the likes of Facebook, Microsoft, Telegram and WeChat. But this launch is a way to get the company's search tools and artificial intelligence in front of people as they're talking with friends. Allo also supports conversations with the Google Assistant, which was also announced Wednesday. By invoking the Assistant, you can do things like make restaurant reservations from within a conversation, without having to switch apps. On top of all that, Allo has an Incognito Mode, which activates end-to-end encryption, discreet notifications, and the ability to set messages to self-distruct after a certain time period. One notable thing about the announcement is that Google already has a messaging app -- its Hangouts product that integrates with Gmail and comes standard on Android phones that use Google's services. It's unclear what's going to happen with Hangouts, since Allo's features seem to supercede much of that functionality. Allo isn't available just yet. Google says it will be coming sometime this summer to both Android and iOS. It was one of two messaging apps launched at Google I/O Wednesday. 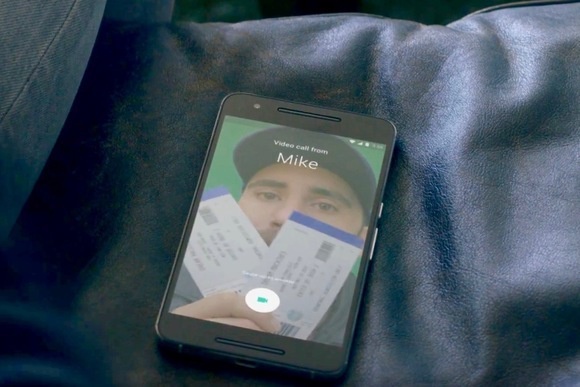 Google also launched Duo, a video messaging app that lets you see video of the person calling before you answer the phone. Google says it gives you more context about a call before you pick up. You can see if the person is smiling, for instance, or where they're calling from. Duo is also coming this summer to Android and iOS.